b.h. Yael is a Toronto based filmmaker and installation artist. She is Professor of Integrated Media at OCAD University and currently Chair of Senate. 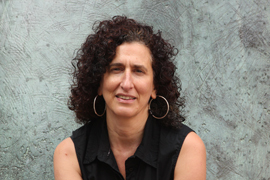 Yael’s work has exhibited nationally and internationally and has shown in various settings, from festivals to galleries to community and activist groups, as well as various educational venues. Her work has been purchased by many universities and she is a recipient of numerous arts grants including the Chalmers Fellowship award. Her essay film Trading the Future, won the ‘Audience Award’ at the Ecofilms festival in Rhodes, Greece. Yael's films and installations have dealt with the many intersections of identity and family; it has focused on activist initiatives in Palestine/Israel, as well as apocalypse, geopolitical and environmental urgencies. Select titles include: Fresh Blood, A Consideration of Belonging; In the Middle of the Street; and Palestine Trilogy. Collaborative and collective projects include Spontaneous Combustion; the Olive Project by the Hardpressed Collective; BlahBlahBlah, Re(viewing) Quebec; and the Approximations series with Johanna Householder. Yael has also programmed arts lectures and media screenings, and occasionally she writes. Yael premieres her most recent project, Lessons for Polygamists, funded by the Canada Council for the Arts, at the Images festival in April 2017. No Lies, a one minute short and silent version won the “Most Original Film by a Local Female Director” award at the 2016 Toronto Urban Film Festival. Cinema Politica Artist Talk with director b.h. Yael. Supported by Canada Council for the Arts. View her full artist profile HERE.